See the installation manual or, if you have already downloaded Borg, docs/installation.rst to get started with Borg. There is also an offline documentation available, in multiple formats. A chunk is considered duplicate if its id_hash value is identical. A cryptographically strong hash or MAC function is used as id_hash, e.g. (hmac-)sha256. file/directory names staying the same: So you can move your stuff around without killing the deduplication, even between machines sharing a repo. 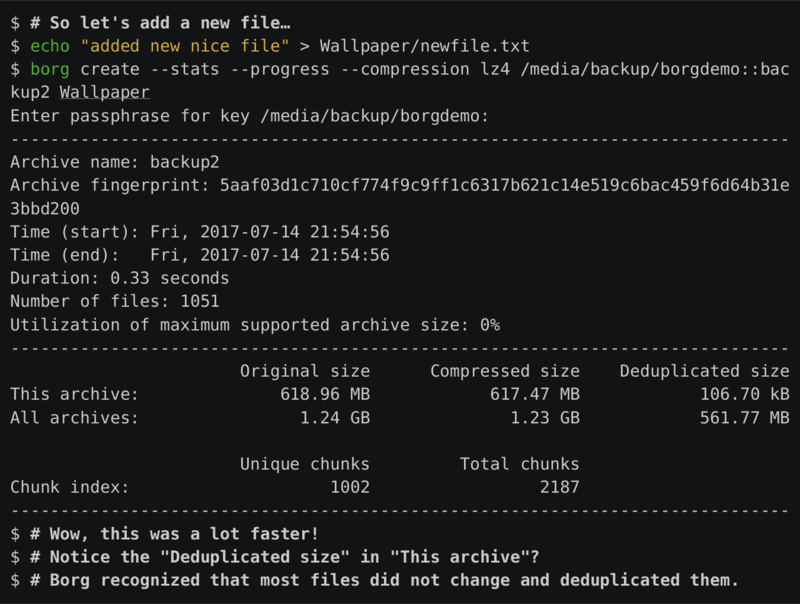 complete files or time stamps staying the same: If a big file changes a little, only a few new chunks need to be stored - this is great for VMs or raw disks. The absolute position of a data chunk inside a file: Stuff may get shifted and will still be found by the deduplication algorithm. This archive:        6.85 MB              6.85 MB             30.79 kB  <-- ! Your help is always welcome! Spread the word, give feedback, help with documentation, testing or development. Security issues should be reported to the Security contact (or see docs/suppport.rst in the source distribution).